Who has the best job in Santa Barbara? Well, if going on incredible trips to Santa Ynez and Channel Islands National Park is a great job, then Brina Carey might just have the best job in town. She has been guiding kayak, bike and surf trips in California for over 6 years. She recently became Santa Barbara Adventure Company’s full time Field Coordinator working with schools and groups to develop multi day, team building and outdoor education programs. Brina also spent the Summer of 2010 camping in the Channel Islands National Park as SBACo’s on-site Channel Islands manager. 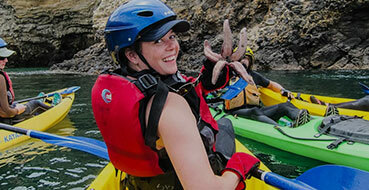 She is an experienced sea kayaker, avid hiker and incredible surfer. What is she up to today? Let’s find out. What adventures have you been on in the last 6 months, guiding and otherwise? I believe strongly in making the most of every day. So while I’m very busy guiding others for SBACo, I love to go on my own adventures whenever I get the chance. Santa Barbara affords me endless opportunities for exploration. There is great surfing and hiking locally and I love to take advantage of it when I get the time. As lucky as I am to live in Santa Barbara, though, I do like to travel. I went to Bocas del Toro, Panama for 10 days this past December to visit one of my dearest friends. She is there volunteering for the Smithsonian Institute, Reef Check, 5 Gyres Institute, and Water for People. We surfed, snorkeled, boated, and laughed a lot. After that trip, my husband, my dog, and I took 3 weeks to go on our annual trip down the Baja Peninsula. We take our camper and our surfboards and relish in the delight of having no internet, phone, TV, or responsibilities other than eating, sleeping, and exercising. Baja is one of my favorite places. It’s the perfect place to recharge my batteries, which is just what I need after a long season of guiding. How did you get to choose guiding as your way of living? What is it about guiding that makes it so energizing? When I started college, I knew I wanted to work with at-risk youth in outdoor settings. I didn’t know the best route though, so I picked psychology as my major. When I took a Recreation 101 class, I was told about opportunities to intern at the school’s Ropes Course. The experience was an eye opener. I learned so much about myself and about how to work with and manage groups. Most importantly I worked with an amazing group of people who eventually convinced me to change my major to Recreation. My degree taught me a vast range of things, including the legal and fiscal aspects of managing recreation programs, programming, resource interpretation, and land use planning. I think what I learned most, though, is that everyone has some connection to the outdoors, whether they know it or not. And if you look deeply enough you can help others find that connection. Through guiding I’ve learned that all people benefit from outdoor recreation. This is true now more than ever, considering the ever-increasing amount of technology we use and the ever-decreasing amount of time we spend outside. I love that I introduce people to the outdoors, show them things they may never have noticed, and build their confidence to do outdoor activities. The most energizing thing about guiding is knowing that we created an unforgettable experience for our guests. And lastly, what can you tell people who read about these trips with fascination, but think it’s probably not for them? Our trips are for everyone! Some of my kayaking guests in the recent year included grandchildren and grandmothers, ultra-marathoners, people overcoming their fear of the ocean, school groups of all ages, non-swimmers, river guides, and entire families. I encourage anyone to try our trips; chances are we have something perfect for you. One of the best things about SBACo is the staff. My coworkers are one of the greatest benefits of my job. We all take pride in our work and want to create the best experience possible for our guests. Our office staff is very helpful and will take the time to answer any of your questions and help you find the adventure that best suits your needs. Our guides are well-accustomed to having all types of participants on our trips and are happy to accommodate you. So my advice is that if you’ve always wanted to try an adventure like this, there’s no better time than the present.